The following article begins a descriptive series detailing various positions that our firefighters fill. From basic skills to top management, all roles are vitally important in making our Fire Company function well. We hope these articles help community members better understand how we function as a team using everyone’s strengths within a chain of command. The pager goes off. The call comes in. The firefighter immediately heads to the fire hall while continually listening to updates on his pager. What roads are being closed? Who will be in charge at the scene? The more he knows about the emergency, the better he can serve. At the fire hall he gears up, climbs on the truck, and pulls on his air mask while en route to the fire. Depending in which seat he is riding, he will have a specific assignment. Updates keep coming in, a plan of attack is starting to take shape, and everyone prepares mentally for what will be required. At the scene every eye is observant, looking for concrete clues. Are there cars in the driveway? Are there exits that need to be checked? What type of construction is the building? What color is the smoke? All firefighters understand that their activities at the scene need to be coordinated and that the timing of each step is important. As the Fire Chief implements his strategy, the firefighter takes orders. He might man hoses and apply foam. If he is the vehicle driver, he will stay with the truck, start the pump, and open and close the valves. The newest firefighter will do the less intensive jobs such as pulling the supply line. After the fire is contained, the firefighter will be thorough and check for re-burns, which might mean taking walls apart. Back at the fire hall, the cleanup begins. He helps sanitize air packs, pressure washes all the hoses and trucks, or washes and dries the gear. A Hand-in-Hand firefighter needs to be willing to serve in whatever way is required. Firefighting is not just about lights and sirens, but sometimes means raking leaves at the fire hall. He needs to a team player since firefighters do not work alone. He also must be safety minded, able to formulate a plan, apply the training that he has received, and stay focused and calm. At our Fire Company we have a pool of 25 basic firefighters who respond to calls. We are blessed with well-trained, capable firefighters who accept orders and work together as a team to keep our community safe. 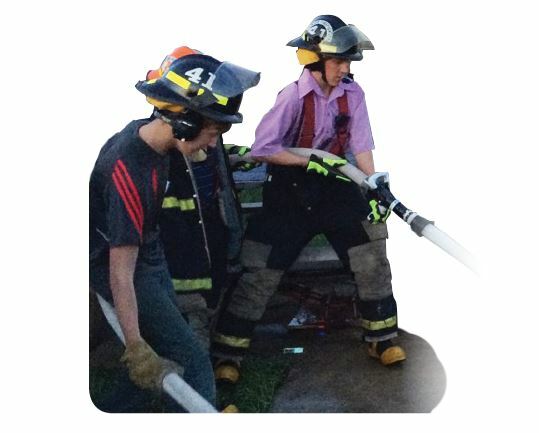 Thanks to Doug Glick, basic firefighter and trustee, who contributed information for this article.